Location: Puget Sound, starting and finishing lines in Shilshole Bay. Classes: PHRF-NW, IRC/ORC and other classes with at least five boats may apply. Monohull, multihull, and casual class boats will race in separate classes. North Wind: Start by leaving the starting mark buoy to port, round mark “N” to port, round mark “K” to port, and finish by leaving the finishing mark buoy to port. Course distance ~ 21 NM. South Wind: Start by leaving the starting mark buoy to starboard, round mark “K” to starboard, round mark “N” to starboard, and finish by leaving the finishing mark buoy to starboard. Course distance ~ 21 NM. North Wind: Start by leaving the starting mark buoy to port, round mark “N” to port, round mark “W” to port, and finish by leaving the finishing mark buoy to port. Course distance ~ 12 NM. South Wind: Start by leaving the starting mark buoy to starboard, round mark “W” to starboard, round mark “N” to starboard, and finish by leaving the finishing mark buoy to starboard. Course distance ~ 12 NM. 8 hours for the first boat in class and for other boats the later of 8hours or 1 hour after of the first boat that sails the course. Boats must comply with equipment requirement category USSER Nearshore, as amended. 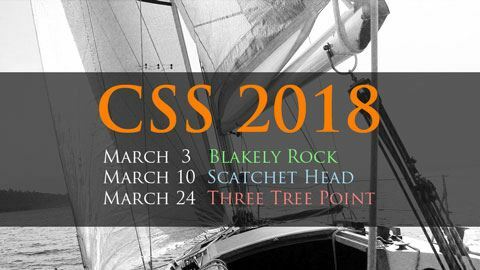 This race is part of the CYC Center Sound Series. For the race, 1st, 2nd, and 3rdin class. Party and awards at the CYCclubhouse after racing. For the Center Sound Series, see awards for the Three Tree Point Race. $60 (or $150 for Center Sound Series). Casual Class $30 (or $90for Center Sound Series). Join us for the Skipper and Crew Meet and Greet for a chance to, have a drink, enjoy some dinner and meet skipper/crew that are looking for.